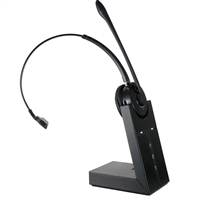 Wireless DECT Headset with up to 350 feet of Range Dont just sit there. You need to move. Get that cup of coffee while still talking. Answer and end calls while youre away from your desk too, by adding a Remote Handset Lifter or Electronic Hook Switch. Eco-DECT lower emissions as well. You will really appreciate the crystal clear sound and voice quality. The noise canceling microphone screens out the noise around you so you will be heard as well as you can hear. Wireless range up to 350 feet Noise-canceling microphone.